Or click here for a plastic-wrapped bundle, shot by Austrian artist and prankster Michael Marcovici, writes Adrian Ash at BullionVault. But if you click here, on the other hand, you’ll find proof of $1 billion-worth of physical Gold Bullion, every last gram of it privately-owned by private individuals using BullionVault. It would be fatuous to ask which holds more value. Because to most people, the pile of Dollars wins hands down. Cash has immediate utility; you can’t go shopping with gold. But to the handful of people (well…21,000 and counting) now holding that $1 billion in gold at BullionVault, there’s a clear preference for rare, indestructible metal. Because as an asset to hoard, rather than spend, gold is unsurpassed. “Keeping your gold in the dirt doesn’t help if you have to get up and flee,” says one chatroom comment. “It does if it’s buried where you’re fleeing to,” says a reply. Which explains, perhaps, why BullionVault‘s predominately UK and US-based users have opted to keep 75% of their gold property in Zurich, Switzerland, rather than in our alternative locations of London or New York. For as long as the rule of law still reigns in your home jurisdiction, however, might gold’s dominance as the hoarding asset par excellence be under attack? The finance industry would certainly like you to think so. “Copper is also increasingly being seen as scarce and is in many ways adopting some store of value attributes normally associated with precious metals,” said J.P.Morgan’s metals strategist Michael Jansen to a conference in Shanghai last month, talking up the attractions of JPM’s copper-backed trust fund ETF. More broadly, “Global liquidity conditions influence the dynamics of [both] crude oil and fine wine prices,” find Serhan Cevik and Tahsin Saadi Sedik of the IMF in a recent working paper. Electricians, car-drivers and wine-snobs alike are thus exposed to “excess liquidity”, aka the deluge of cheap money still pouring out of central banks the world over. Allowing US bond yields to reach their 200-year average of 5.8% would risk destroying the republic, judging by new analysis from SocGen. Meantime in Europe, Jean-Claude Trichet of the ECB ain’t no Charlie Bronson, despite his tough talk of “vigilance” last Thursday. And so with the money-flood set to roll on, the bid for rare, tightly supplied physical assets looks set to keep rising, too. “Welcome to the world of a gold analyst,” as John Reade – then metals strategist at UBS, speaking to the LBMA Conference – said to industrial-commodity analysts back in 2005. Speculation, hedging, hoarding or whatever else you call it has, in short, been a growing trend since the start of the century. Once upon a time, such flows into natural resources, whether financed or frightened by loose money, would have wound up in gold and Silver Bullion. Whereas today, and throughout the last half-decade, cash-rich investors have also sought stronger and faster returns in other, more volatile, less traditional investment markets. This chart from Morgan Stanley, republished with permission by our friends at the Cobden Centre, shows a connection if not causal link between world commodity prices and US monetary policy. However the Fed’s quantitative easing got into the market, the investment bank’s Caitlin Long believes it clearly boosted the CRB index of raw material prices substantially. On her chart, QE1 marks 25 Nov. 2008, the day that the Fed began buying mortgage-backed securities. Whereas QE2 marks not the start of asset purchases but the clear intent, stated by Fed chairman Bernanke – at the Jackson Hole central-bankers’ summit – on 27 Aug. 2010. Morgan Stanley’s chart misses a trick though. Because just as commodity prices seem linked to the Fed’s largesse during and after the banking crisis, so they look tied to US interest-rate decisions on the pre-crisis chunk of the chart, too. In June 2003, the Fed cut rates to a (then) record low of 1.00%. Commodity prices bottomed and rose by a fifth before the Fed then began raising its key lending rate 12 months later, in June 2004. The Fed then raised rates 17 times over the next two years, nudging the cost of Dollars higher each time until it reached 5.25%. At which point, in June 2006, both the broad commodity market and the foodstuff sub-index stopped moving sideways and broke upwards. But are central banks or speculators to blame? Central banks merely pump out cheap money; it’s the evil hoarders of hedge funds, gold buyers, oil traders and ETF designers who choose to direct that money into hard assets…rather than, say, US housing or mortgage-backed bonds. Right? “Prices have risen sharply for many commodities that have neither developed futures markets (e.g. durham wheat, steel, iron ore, coal, etc.) nor institutional fund investments (Minneapolis wheat and Chicago rice),” found a study for US watchdog the CFTC from its very chief own economist in May 2008. “Markets where [big fund] index trading is greatest as a percentage of total open interest (live cattle and hog futures) have actually suffered from falling prices during the past year. Quite how the Fed’s cheap money has got (and will continue to get) into the costs of foodstuffs remains unclear, in short. But that it has pumped up the cost of getting by worldwide is clear, we fear. Call it speculation, hedging, hoarding or profiteering if you like; it won’t matter. 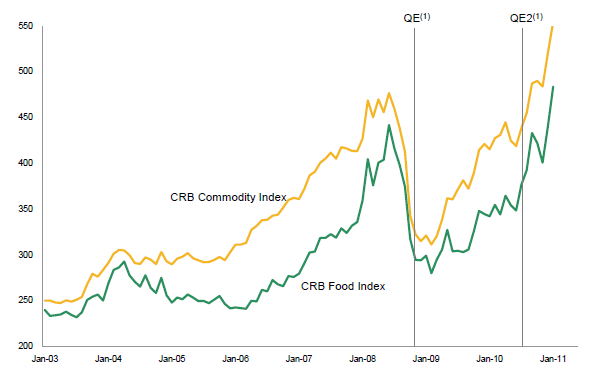 The rise of commodity and Gold Prices off the back of ultra-cheap central bank money looks set to continue regardless.